Top service for more than 15 years! from small custom-designed websites, one-page websites or very sophisticated online stores. We also offer a lot of help and advice as we go along so do not worry if you are not a web guru, we are there for you. Each of our websites can be developed with a very easy to use content management system, also known as a CMS and we also offer a free short basic training (in person 1-on-1 and with “over the shoulder instruction”). videos embedded in your site) about how you can use your website independently. And all this for an unbeatable price! Request your free, tailor-made offer now. We offer web design services, website hosting and website management services. We are driven to offer high quality web design for an affordable price. We will listen attentively to what you expect from your new website and discuss with you the functions you would like to add in your new customized website. Our websites are designed to achieve good rankings in search engines, and can scale up well with your growth plans. 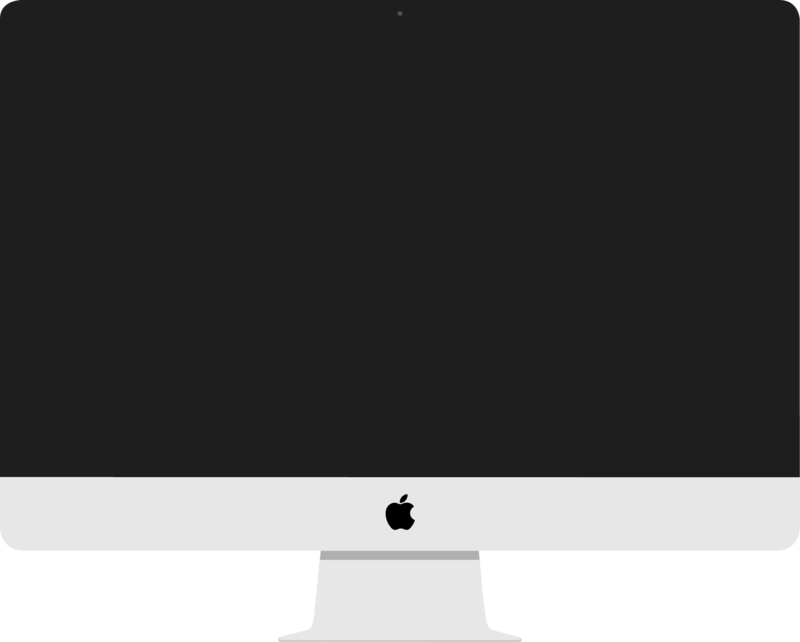 Are both affordable and effective – developed with original modern design, responsive to all screen sizes and search engine optimization best practices. 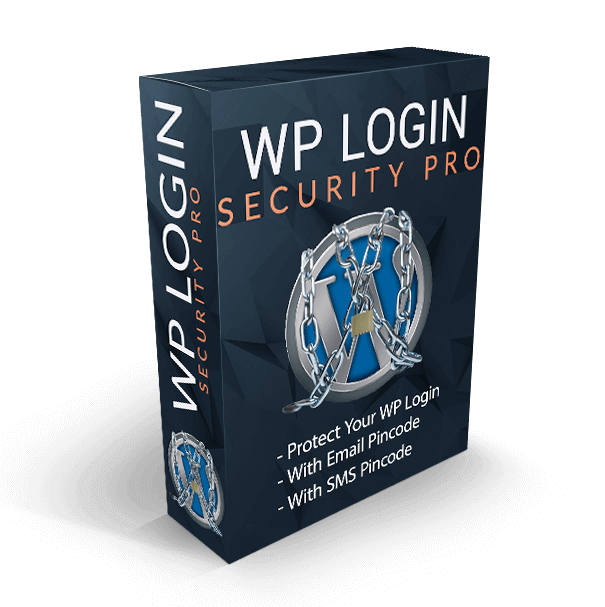 We provide your website with various security software and keep your website up-to-date on a daily, weekly basis. Tanita is a world leader in electronic precision scales. With almost 50% of the domestic market share, the name Tanita is a household name in Japan. The success of the company and its growing global presence is the result of superior technology, unique design and high production standards. Since 30 years, Weda B.V. is importer and distributor of Tanita in Belgium and the Netherlands. 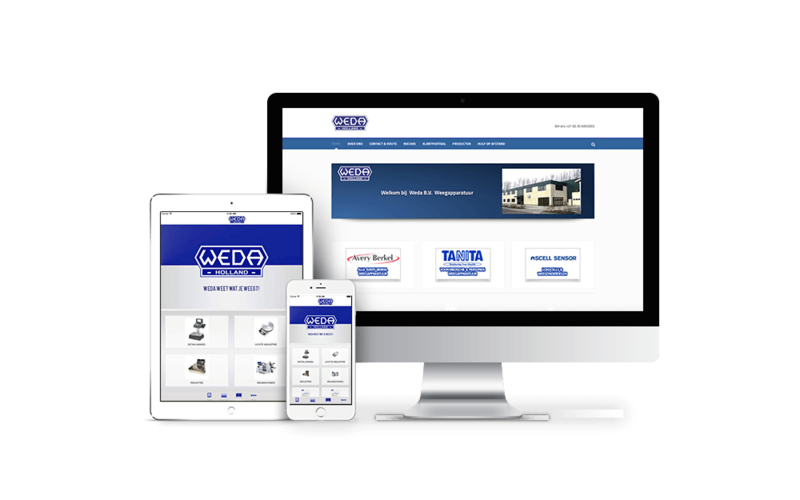 Weda came to us to build a new sleek and modern e-commerce store that would do justice to the brand. 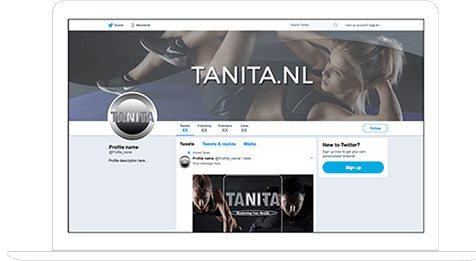 In 2019 a new version of the webshop is made by us. 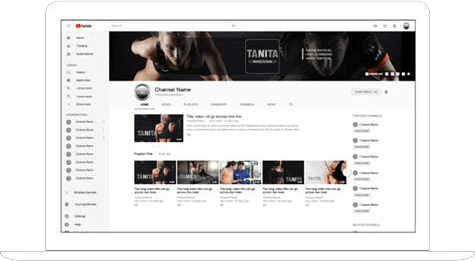 In addition, we have designed a YouTube channel, Facebook business page with animation video header and Twitter account. A state-of-the-art online marketing chat bot is also implemented on the website, Facebook page and Twitter account. 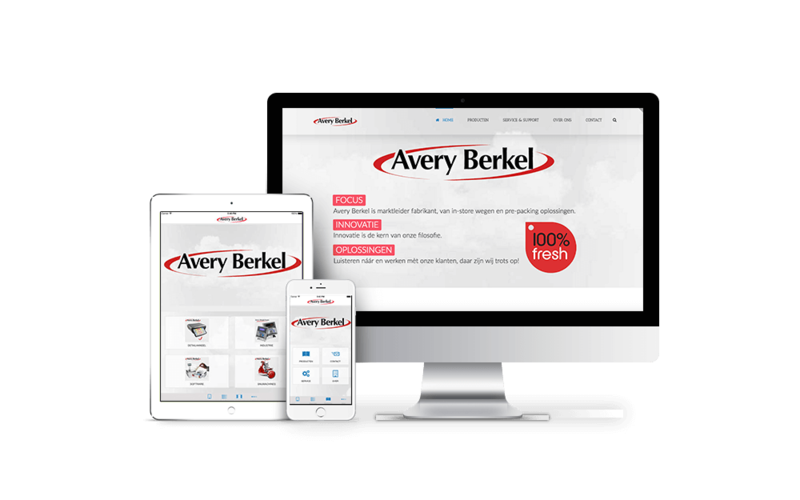 Avery Berkel has a rich history, they have worked together with the industry since 1875 and understand like no other the changing nature of the markets, constantly evolving to deliver what the customer wants. Their visionary performance is one of the first, technical progress and design triumphs. The exclusive importer and distributor of Avery Berkel in Belgium and the Netherlands is also Weda BV. As a distributor of Avery Berkel in retail, Weda offers a complete range that can meet every demand. Weda B.V. is manufacturer and importer of a complete delivery program weighing equipment. As early as 1949, the first scales for industry and clock scales for retail, market and ambulatory trade were manufactured by Weda. Weda is the importer of Avery Berkel (retail and industry), Tanita (professional, consumer goods and medically approved body composition analyzers), Denver Instruments (laboratory scales) and Graef (Cutting machines). 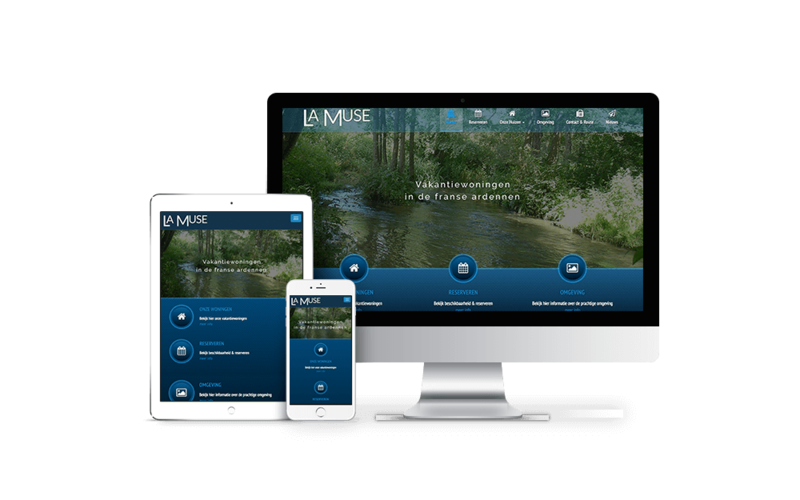 The owners of La Muse Ardennes Holiday homes in the French Ardennes, needed a complete make-over from their early 2000s website. It really needed a total make-over. So we have built a brand new sleek modern website for them with a complete booking system integrated into it. Now they can manage the bookings from the website. Each reservation will be automatically emailed to them, as well as a confirmation to the customer, they can show the availability per house and easily integrate rates for eg house cleaning service and the like. They were so satisfied with the final result that they decided to let us create a similar website for their other holiday rental in France. They chose our Web & Social Solution package and we also built two Facebook fan pages. We provide daily maintenance and recently we have created advertisements to publish on Facebook. We create the advertisements, target them with extreme precision to their specific target group, arrange the placement, the bidding and also the payments for them. In Castricum the artist Ans Martens Studio K. works with natural materials such as wool, cotton, silk and linen. The clothing is often made of fabrics that have been hand dyed, printed, knitted and / or felted. The fibers including also mohair, bamboo are hand dyed and are processed into felt. Of these, jackets or vests are made that – worn on a quiet basis – give an exclusive look. You will also find accessories such as scarves, hats, hats, brooches, necklaces and bags. Ans Martens needed a complete make-over from her old website. The website was already more than 6 years old, was not mobile responsive and simply no longer met the current requirements imposed on websites. 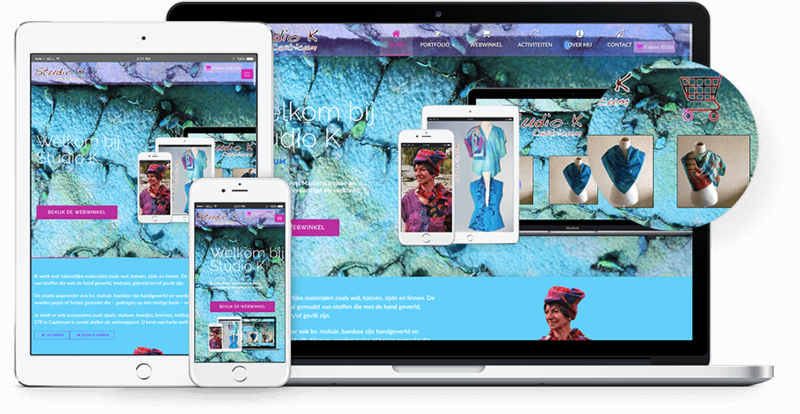 So we have a beautiful modern and colorful website, completely built from the ground up, complete with contact, and workshop registration forms and we have even integrated a modern web store so that she can also sell her creations online. She opted for our Web Solution package. We take care of the daily maintenance of the various software modules and ensure that its site is 100% functional, now and in the coming years. A.B.Clean is a specialized company in the sucking and blowing of dry substances. A.B. Clean works throughout the country and also has a branch in Helmond. The director of A.B.Clean needed a complete make-over from the old website. It really needed a total make-over, the site was not mobile responsive and simply no longer met the current requirements of websites. So we have built a brand new sleek modern website, built entirely from the ground up, complete with contact, and quotation request forms and integrated page integrated. We even have a WhatsApp chat module built in, so that customers can chat directly with an employee via WhatsApp. We have chosen our Web & App Solution package and we also built a smartphone / tablet app suitable for iPhone, iPad and Android. We do the daily maintenance of the various software modules and provide a 100% optimized website that is well indexed in search engines such as Google. The Jacobs Group, Jacobs Dienstverlening B.V., is located in Balkbrug. One needed a complete make-over from the old website. The website was already more than 7 years old, was not mobile responsive and simply no longer met the current requirements of websites. So we have a sleek modern website, completely built from the ground up, complete with contact, application and quote request forms and we have also integrated a modern chat function and developed a business app for smartphones and tablets. 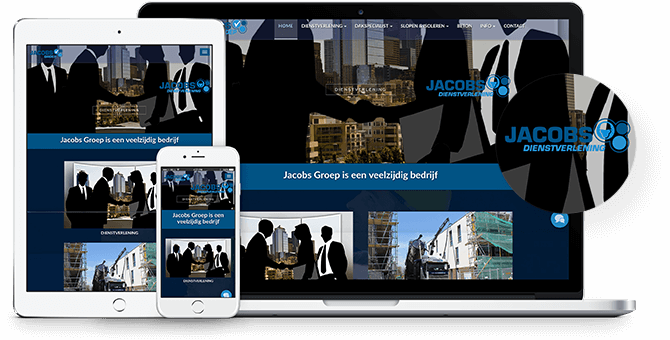 Jacobs Group has opted for our Web & amp; App Solution package. We take care of the daily maintenance of the various software modules and ensure that the site functions 100%, now and in the coming years. 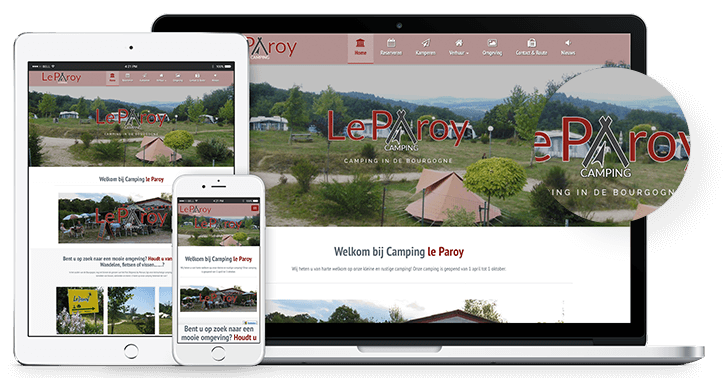 The owners of Camping Le Paroy in French Burgundy on the edge of the Morvan nature park, needed a complete makeover of their old website. It really needed a total makeover, the site was not mobile friendly and a new website also fits a new website! So we designed a new modern logo for them, built a brand new sleek modern website, integrated with a complete reservation system. Now they can manage the bookings from the website. Each reservation will be automatically emailed to them, as well as a confirmation to the customer, they can show the availability per rental object (eg holiday home and various rental tents) and camping place and easily integrate rates for eg house cleaning service, electricity and the like. They chose our Web & Social Solution package and we also built a Facebook fanpage. We take care of the daily maintenance of the various software modules and we have already spoken to develop a special smartphone app for their campers and tenants. “We have personally been able to discuss our wishes with the web designer. We’ve listened to us carefully! 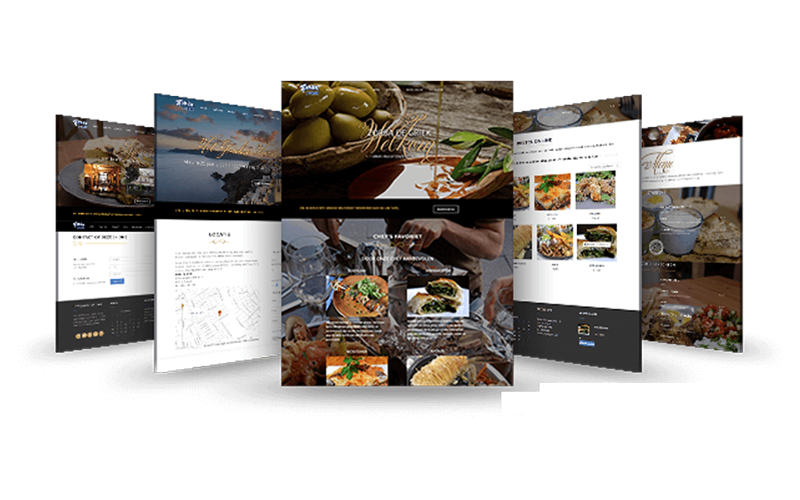 Restaurant Zorba, located in Bussum, came to us for an affordable but above all modern and accessible website where their customers can book a table or order a meal to take away. Also important for manager Yianna, was an easy way to manage her reservations online and to present their seasonal menus. 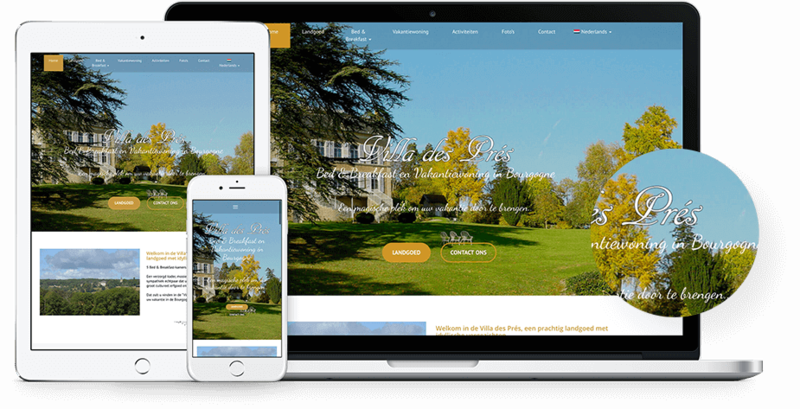 Kees and Inge from La Villa des Prés in French Burgundy needed a complete make-over from their old html website. It really needed a total make-over; the site was not mobile friendly and had no clear routing. We have designed a new logo for them and built a brand new modern website, both with an eye for appropriate design style that does justice to the allure of this beautiful building. The site is also equipped with an advanced translation module, allowing the website to be viewed in no less than 5 languages. They chose our Web & Social Solution package and we also built a Facebook fanpage with video header. Sylvie and Nico opened their store in Eeklo on May 1, 1999. In no time the equally quirky and likeable confectioner from Eeklo built his bakery into a flourishing business. With a sense of refinement and finishing, he conceives a range of products whose quality does not go unnoticed. Choosing radically for only the best raw materials is part of his concept. The renowned magazine Culinaire Ambiance awarded him the Topwinkel label and since November 2012 Nico has been a master patissier at the Order of the 33 Master Chefs of Belgium. So when they made the choice to choose to make a website that reflects their quality craftsmanship, we were very proud. Sylvie and Nico also emphasized the importance of Facebook for their company. They communicate many times a day with their loyal followers and customers via Facebook. They chose our Total Solution Package and we built them a website containing beautiful images of Nico’s art-like creations in combination with an iPhone / iPad app and Android app (in the app we even implemented a simple cake throwing game). 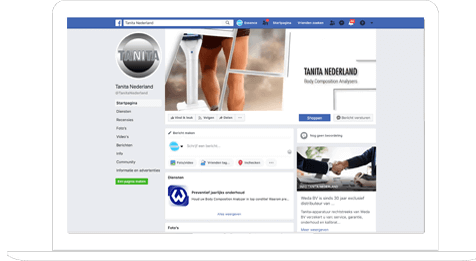 We also integrated the brand new website into their Facebook fanpage, allowing for greater interaction with their audience and customers.